John and I spent most of today removing the fountain grass we discovered along the southern boundary with the defence department - will need to contact the defence department to get them to remove the fountain grass in their land. 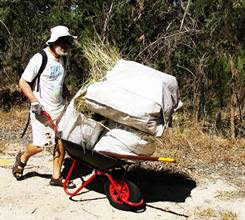 John took a photo of me pushing the wheelbarrow with the results of our labours back to the front gate. Christmas (spiders) just around the corner!